Can You Substitute Margarine for Shortening in Dumplings? Polyurethane foam is commonly used in mattresses. 2 What Is Steam Frying? Foam is a form of aerated plastic produced in many different variations. It has a multitude of uses ranging from furniture padding to packaging and construction insulation. Tons of foam are produced every year, which means that a great deal of waste is produced if the foam is not recycled into further usable forms. The three most common types of foam used in consumer goods are all recyclable, depending on the local availability of specific recycling facilities. Refer to the References section at the bottom of this article for further information on recycling centers. Polystyrene foam is manufactured in two forms, both of which are recyclable. Expanded polystyrene foam (EPS) is a white, brittle foam made up of many small beads of expanded foam that are bonded together. It is commonly used in the production of disposable beverage cups and packaging. The second type is extruded polystyrene foam (XPS). This type of polystyrene foam has strong insulating properties and is used as an insulating material in the construction industry. The Alliance of Foam Packaging Recyclers coordinates the recycling of polystyrene foam. 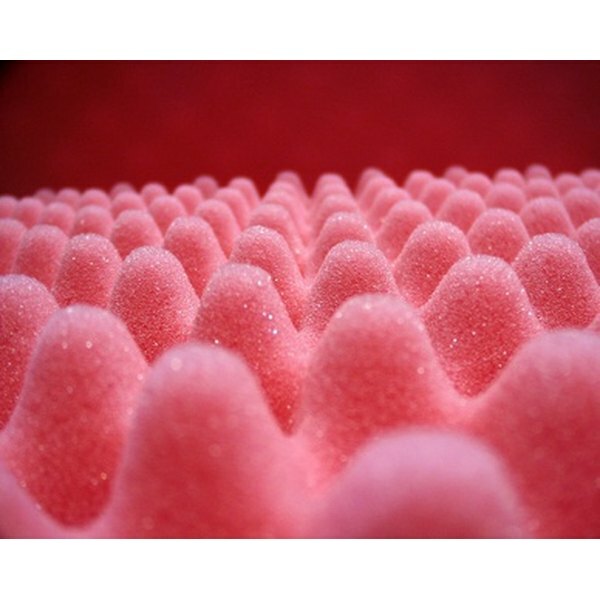 Polyethylene foam is a dense foam manufactured for many uses. The most common of these is as a protection medium in consumer packaging. Its dense structure provides adequate protection for consumer products during transit, without requiring much volume. Another feature of polyethylene foam is that it contains a large volume of air, making it buoyant, which is ideal for marine purposes. Polyethylene foam products marked with a number "4" recycling logo can be sent to a member of a dedicated program for recycling. Polyurethane foam is most commonly used for furniture padding, carpet underlay and athletic mats. It can be recycled in two ways. Regrinding involves grinding post-consumer foam into a powder and then using that to produce new foam. Flexible foam bonding involves recovering pieces of foam and then shredding and rebonding the pieces to produce new foam products. Treehugger: What Can We Do With Our Used Styrofoam? Does Lack of Vitamins Cause Vitiligo? What Does Infuse Mean When Baking?